Saheed Osupa In Bad Mood Over American Visa Denial. Controversial Fuji musician, Saheed Osupa popularly called Saridon P is not happy as you are reading this. Information reaching us has it that, the self-acclaimed King of Music is sad at the moment because he was denied American visa on Monday, 29th of August, 2013 at the American Consulate, Abuja. According to whispers coming from Abuja, we learnt, Saheed Osupa, who had a long battle with K1 De Ultimate over superiority, was supposed to travel to America for a show put together by a certain Nollywood stakeholder. Also on the list of those present at the American Embassy are veteran movie directors, Wale Ilebiyi and Bayo Tijani who were equally denied visa to Uncle Sam's country. 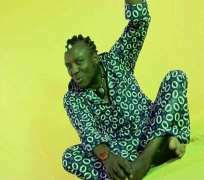 Amazingly, one of Saheed Osupa's band boys, Kokoro Taofeek, our source said, was the only one that got the visa. For being denied a visa to the USA, Saheed, we gathered, has since been cold to friends and folks. Some are even of the opinion that the fate of Kokoro is uncertain as his boss, Saridon Papa, who was supposed to finance the trip, has been denied a visa and he's likely not to be disposed to sponsoring his trip.